We abstained from turkey on Friday so it doesn’t look so intimidating on Saturday. 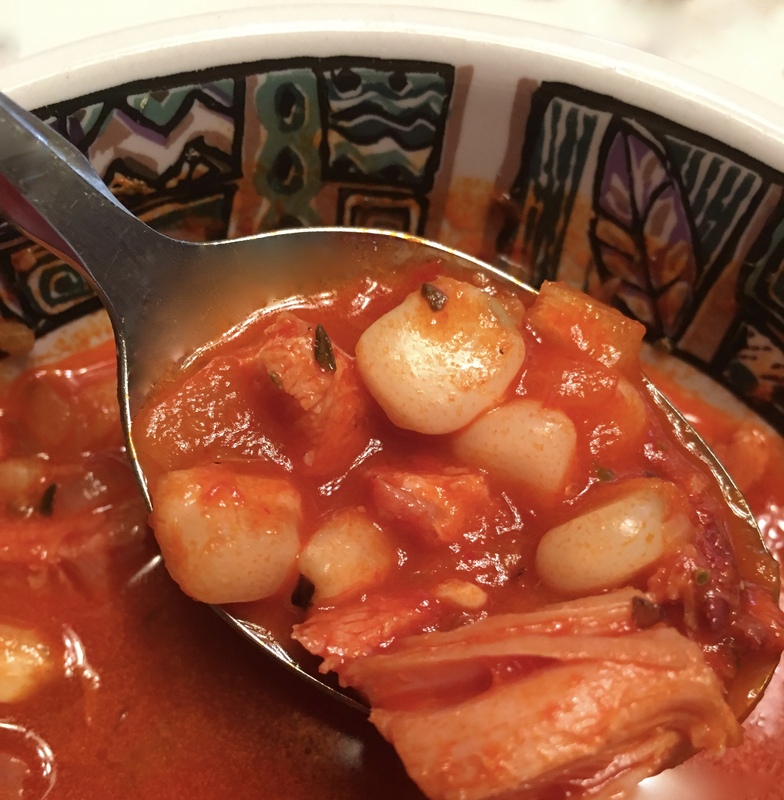 Feeling the pangs of chile withdrawal and remembering what was on hand, I decided to make posole de cocono – a soup of turkey, hominy and chile. (Hominy is posole in Spanish.) 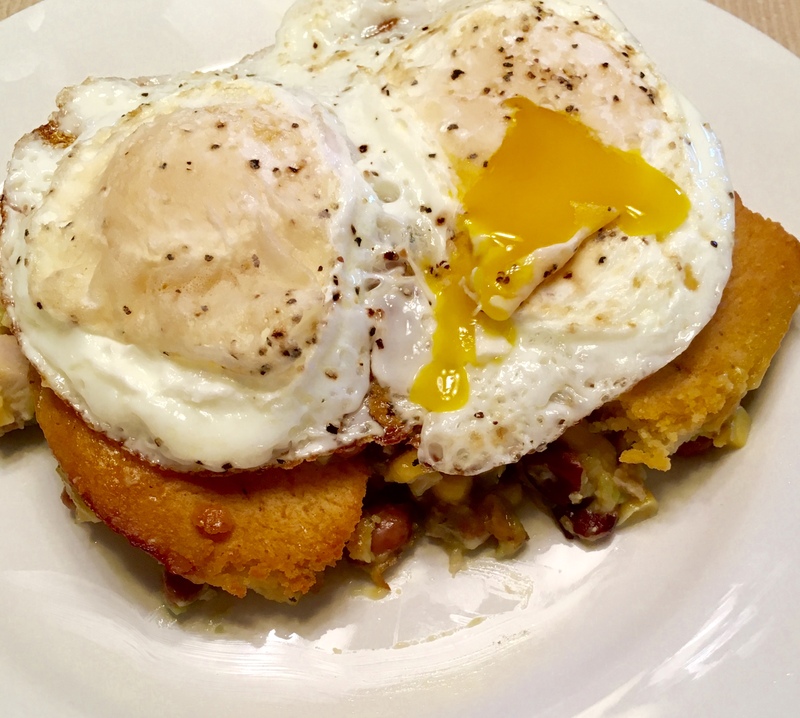 Red chile pork sole is a favorite breakfast on a cold morning at Sofi’s restaurant. Green chile chicken posole is another favorite version. During the holidays I like to my Christmas posole – a clear seasoned broth with chicken bowls of both red and green chile on the side so people can add the one they want or a little of both. Last summer I discovered a restaurant in Las Vegas, NM’s historical downtown district that served Nixtamal as a side dish. I liked it and was happy to discover a couple of local groceries carry it. Nixtamal is slaked corn. That means dried corn soaked in a solution of water and lime. I read several articles on making Nixtamal and was more than glad to find it already slaked and frozen. I rinsed thoroughly to be sure the lime was gone before cooking it. Nixtamal can be boiled and soaked for 2 to 24 hours, depending on what you want to use it for: for hominy, boil 15 minutes and soak for 15 minutes; for tamale dough, boil 15 minutes and let soak for one and a half hours; for tortillas, bring to a boil, remove from heat and let soak overnight. I was intent on making posole also used as the name for the soup containing chile, hominy and meat. I read that for hominy, you rub the hull off the kernel. The hull looks for like a dark spec on the tip of the kernel. A thin Tough skin clings to that speck and comes off with it. The suggested removal method was using your fingers to rub it off or to pick it off. “Ha!” I said, “What difference could that make?” It made a big difference; it took about two hours for the Nixtamal to soften to a comfortable chew state. My package of Nixtamal was two pounds. I reserved a pound for another experiment. I will take the time to rub the hulls off then. I used a favorite short cut for my red chile sauce. El Pinto Restaurant in Albuquerque makes a wonderful line of chile sauces and salsas. The red chile sauce and green chile sauce are staples in my pantry so I can make red or green enchiladas in a hurry if I don’t want to spend a morning making them from scratch. I mix the red sauce with an equal amount of water an sometimes add a little oregano and garlic to it. I don’t dilute the green sauce. It is huevos rancheros right out of the jar. 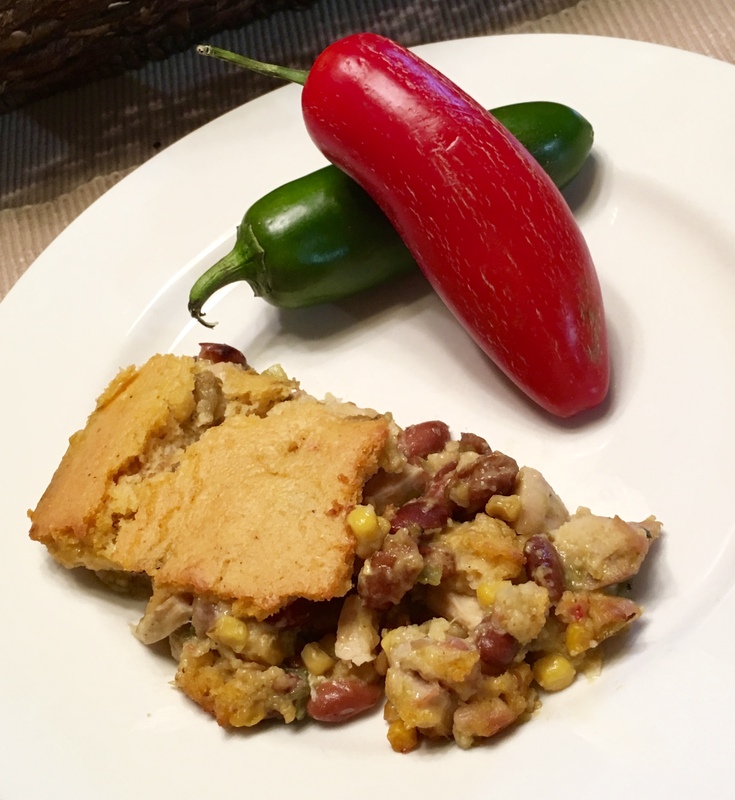 Turkey leftovers El Paso style – a posole with turkey, Nixtamal and red chile. Sometimes diced onion and dried oregano are sprinkled on top at other times shredded cabbage and chopped radishes are the garnishes of choice. I’ll have to call this a Nixtamal rather than a posole. When Nixtamal is deemed tender, add cubed turkey and bring to temp. Add chile, taste and thin a little bit if needed. El Pinot medium chile is a good bet for heat. I eat hot chile, but find the hot sauce a little strong. Let mixture in pot simmer to blend in the chile flavor. I spoon out a Nixtamal kernel to taste when judging readiness. Serve in bowls and let diners garnish with onion and oregano or with shredded cabbage and diced radishes if desired. A squeeze of fresh lime juice is also good. Nixtamal has a better flavor than canned hominy. Hull the Nixtamal if you want to use it. Allow plenty of cooking time. Maybe next time cook the Nixtamal a day ahead. And, try more ways to used Nixtamal in the future. Post Turkey Tryptophan Hangover Treatment. Overdosing on turkey guarantees at least a nap. It induced a whole night’s sleep for me. A couple of pots of coffee and a morning newspaper read, sans ads, made me think a little bit about breakfast. No turkey anything was on my breakfast radar, so It was raid the fridge time. I was in luck. There was some leftover green chile cheese grits casserole that Jack had prepared for a church dinner and some of his leftover Tequila Lime Jello-O shots. He is Episcopalian, after all. I thought, pan-browned polenta is good, why not pan-browned grits? I patted a few spoonsful of grits to about 1/2 inch thick, put two patties in a medium hot pan and let them firm up and gain a little color. 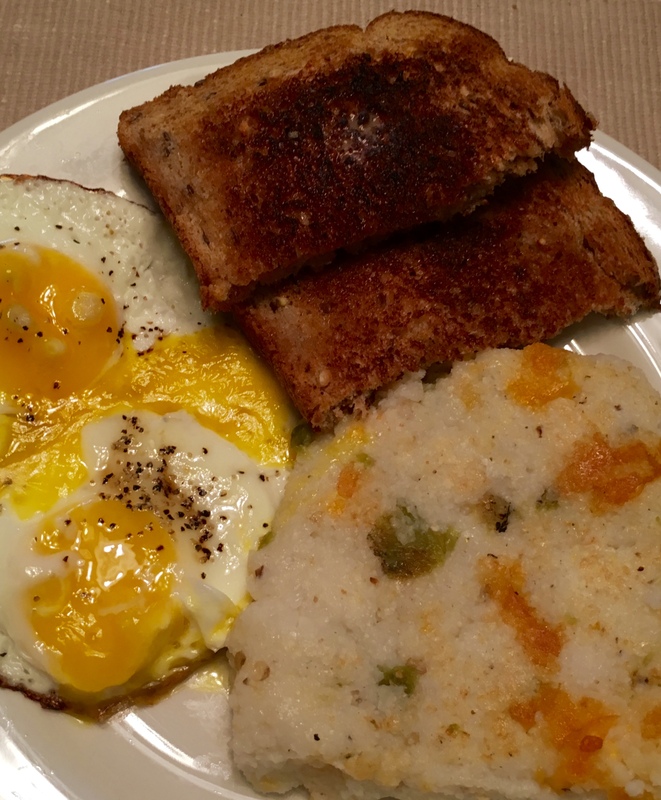 While the grits were warming, I whipped up some fried eggs and a couple of slices of 12-grain toast. The grits got gritty enough, eggs firm enough and the toast a good brown. Time to plate and it was a left-overs+ breakfast. I think the carbs helped with the tryptophan hangover. The Jell-O shots will have to wait for cocktail time. Pan browned leftover chile cheese grits, eggs and toast for a Black Friday Breakfast. My grand-niece hosted Thanksgiving this year in her beautiful new home. It is good to see a young woman join the line of family holiday hosting traditions. My best memories begin with my mother who always cooked as though she was serving all the farmhands at harvest. She established the traditions of corn-bread dressing, great crisp skinned turkey and the best piecrusts in the world made with that secret ingredient – lard. Pecan and pumpkin fillings had to compete with her flaky fluted crusts. I’ve never been able to equal them. Mother’s , aka Grandma Lorene, Thanksgivings were followed by my sister, Arlene, hosting family feasts. I have hosted my share, too. Arlene’s son, Donnie, and his wife, Maria, have been wonderful hosts. And now, Roberta, Don and Maria’s eldest daughter, and her husband, Dennis, have come on line. When my girls, Mande and Emily, are here, they do a great dinner, too. This year was a warm gathering of multiple families including both in-laws and out-laws from the local area. Old folks, young children and the newest family baby were together for a memorable time and bountiful meal together. Everyone contributed their specialties making it all extra special. The only thing missing was cornbread dressing. Someone who will remain nameless, made a very good French-bread stuffing… but it wasn’t cornbread! I may have to make that for myself before this weekend is over. I find it sobering that I am the second oldest member of the immediate family now. I had never imagined holding that post. Age is only on the outside, most of the time. I can still hold my own at the stove in the kitchen and to overeat with the best of them. My contribution to the feast this year was a sweet potato and parsnip tian. And, I modestly admit it was a show stopper! Sweet potato and parsnip tian. 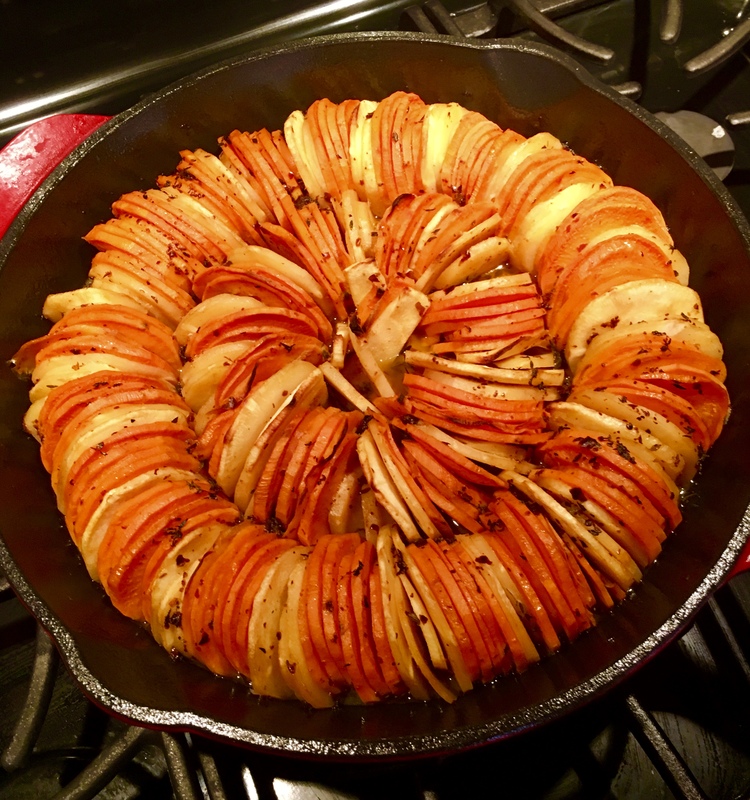 Cooked in apple cider with thyme and Aleppo pepper, it is a delicious as it is beautiful. A tian is a French wide shallow baking vessel. The vegetables cooked in it are also called a tian, regardless of which vegetable they are. Most tians are round which helps create an attractive dish. I was unable to find a tian in El Paso, so I improvised! I found a Cuisinart 11.75″ skillet that I just had to have regardless of what I was going to cook. 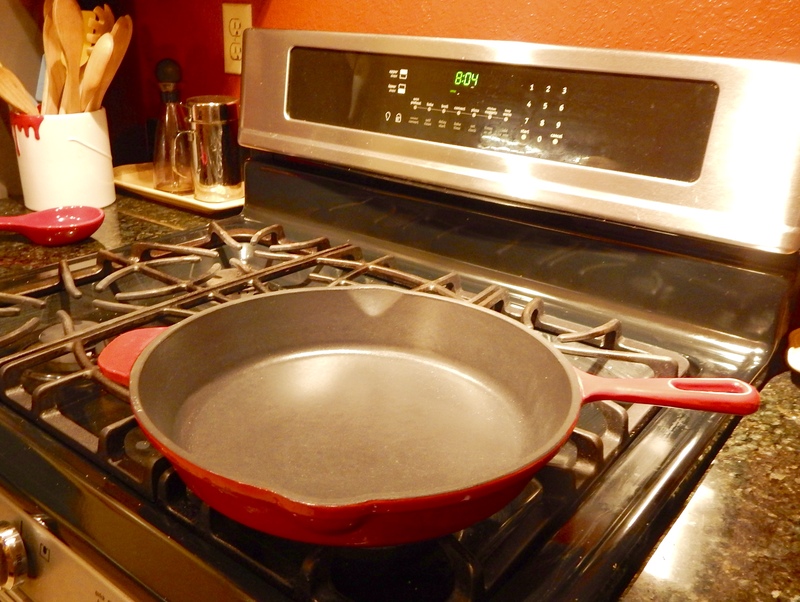 The company has a new line of enameled cast iron cookware. I had read about it and had been looking for it. The cookware is enameled with bright colors on the outside and inside with a flat black enamel finish. It is virtually non-stick and can be put in the dishwasher. Dishwasher safe enameled cast-iron pan, Happy Thanksgiving to me! One thing I have noticed is that cast-iron seems to be heavier than it used to be. Surely that’s a sign of improved quality and has nothing to do with rampant maturity. I want to share that the skillet’s first use was a success and performance was as advertised. You might like to look for it and give it a try. I aso want to share the tian recipe. I made a half-recipe before doing it for the crowd and will add it to my repertoire of relatively simple, delicious knock their eyes out recipes. The Aleppo pepper in the recipe is Moroccan in origin. It has a savory, subtle heat I am growing very fond of. You can substitute a teaspoon of red chile flakes if you can’t find Aleppo chile. Position rack in middle of oven and preheat to 325°F. Bring cider to a boil in a large saucepan over medium-high heat. Reduce heat to low, add butter, thyme, Aleppo, and2 tsp. salt, and cook, stirring, until butter is melted. Let cool slightly. Place potatoes and parsnips in a large bowl. Pour cider mixture over and toss to coat. Stack a handful of slices about 3″ high, then place on edge in casserole dish. Keepslices standing up as you go, working around the perimeter and then into the center, forming concentric circles. Continue arranging slices in pan until tightly packed (you may have some leftover). Pour in cider mixture to come halfway up sides of dish. Discard remaining cider mixture. Sprinkle with remaining 2 tsp. salt and cover tightly with foil. Bake, covered, 1 hour. Remove foil and brush pan juices over tops of slices with a pastry brush. Increase oven temperature to 425°F and bake, uncovered, until golden brown on top, 35–40 minutes more. If you have a mandoline, use it to slice the sweet potatoes and parsnips—it will help you get thinner, more even slices in less time than by hand. If you have a food processor with a wide feed tube and a slicing blade, it will go even faster. The number of potatoes and parsnips you need to fill your casserole dish will depend on their width, so buy extra just in case, and try to seek out parsnips that are as close as possible to the width of your sweet potatoes. The first time I made this, I laid the vegetables flat in a loaf pan. Just as tasty, but not as nearly attractive. Your hands will get buttery so forge ahead and don’t look back. They will wash.
A while back, I raved about the Sabertooth restaurant. My favorite thing on the menu is Nopal (Prickly Pear Cactus) Rellenos (stuffed long green chiles). They have a wonderful cactus and cheese and crema (Mexican style sour cream) filing in a traditional egg and flour fried batter. They served two rellenos with a side of rice. The other day, I posted my own version of prickly pear enchiladas with a chipotle cream sauce and Asadero cheese. The enchiladas were filled with diced cactus, and chopped tomato, onion garlic and green chile. I must say they were very good. I made six enchiladas in a small baking dish. I had some of the vegetable stuffing, chipotle cream and cheese left, so I decided to mimic the Sabertooth rellenos with my leftover enchilada components. I call that creative culinary recycling. You’ve seen how I like to make my rellenos baked with a crispy coating of browned panko crumbs. I gave the cactus rellenos given the same treatment. I stuffed roasted and peeled long green chiles with a strip of asadero cheese and a couple of spoonsful of the enchilada filling. I dredged the filled chiles in flour, dipped them in an egg wash and rolled them in browned panko crumbs. I brown my panko crumbs ahead because otherwise they remain pale and are not attractive. I either brown them on a sheet pan in the oven or on the stove top in a sauté pan over low heat. I baked them at 375° for about25 minutes to warm the filling and melt the cheese. Panko breaded nopal rellenos ready for the oven. I slit the side to make it easier to add the filling. That made the breading a little tricky. 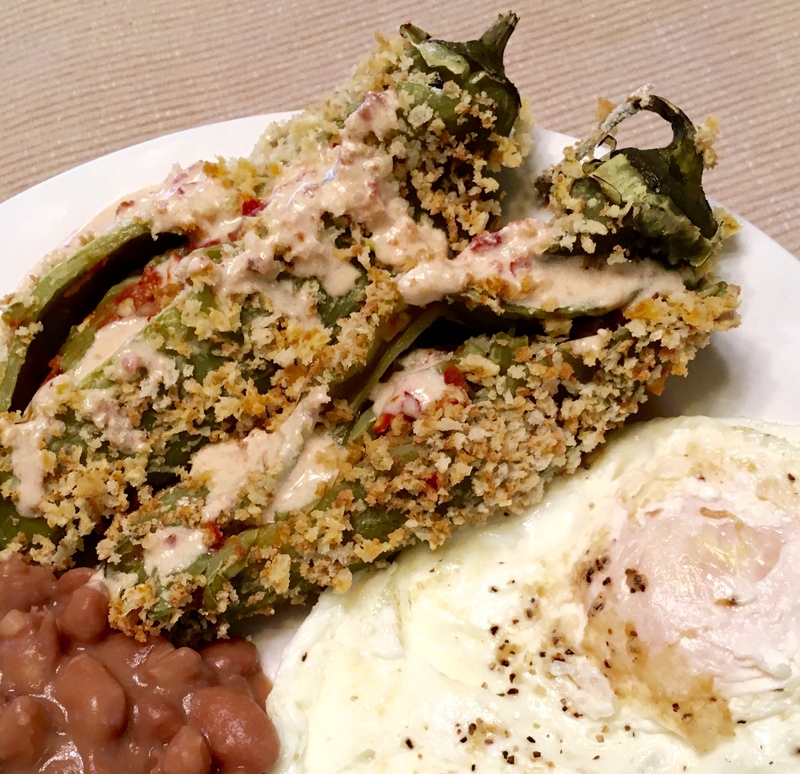 Chile rellenos and eggs are a favorite breakfast in this house. I usually make extra to save for breakfast the next day. This time, I made the rellenos especially for breakfast to recycle the leftover enchilada fixings. I cooked some eggs and reheated some beans from the enchilada supper to round out the recycled meal. 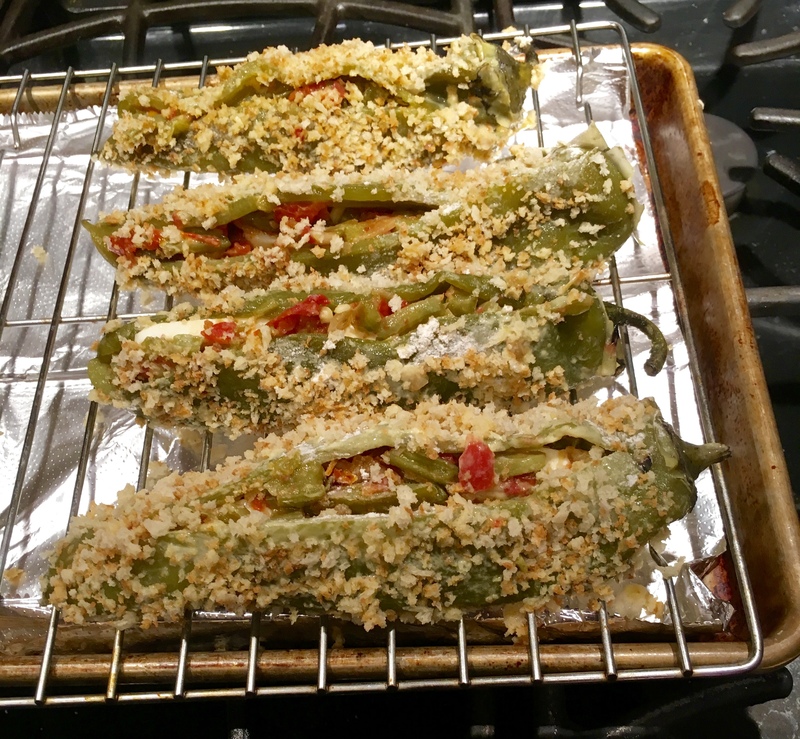 Chiles rellenos with panko crust and a filling of cactus, savory vegetables and cheese. A few drops of chipotle cream add a mild kick. With the addition of eggs and beans, breakfast is served. Prickly Pear Cactus Enchiladas – Definitely Not Your Mama’s Nopalitos! Inspiration comes in many forms. I saw a recipe for portobello and poblano chile enchilada that sounded interesting. I decided not to make the dish, rather, I thought I’d reinvent it using my favorite prickly pear cactus as a filling. I also swiped a favorite chipotle cream sauce idea from a local restaurant, but used half and half instead. I made just six stuffed and rolled enchiladas as a side dish with pint beans. The entré was a very thin ribeye steak pan grilled the way it is done by yet another Mexican restaurant. It looks big, but is about 1/4 thick and weighs in at a light four ounce serving. An imported Indio beer was the beverage of choice! Mexican inspired dinner. 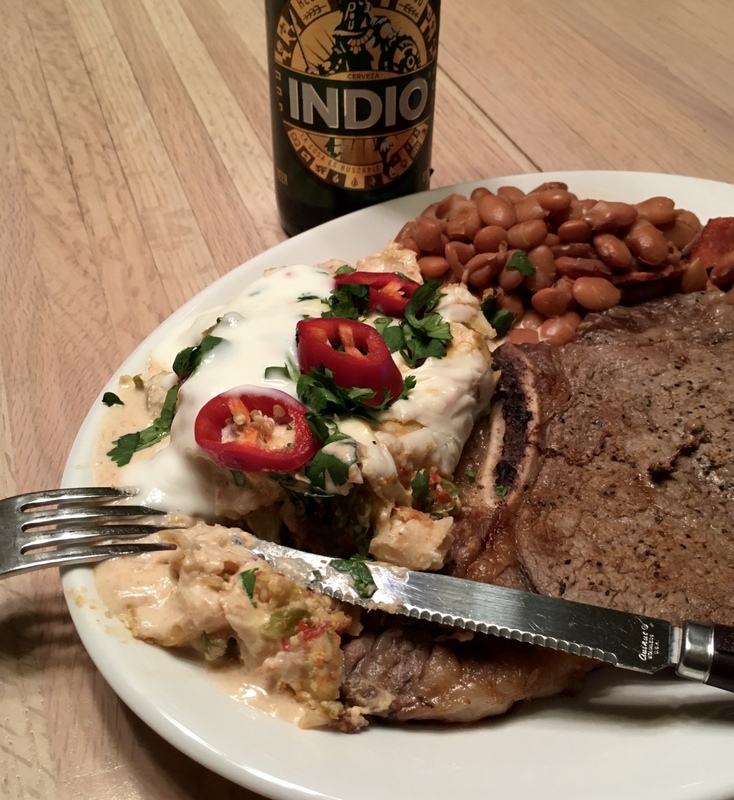 A thin steak, pinto beans, a cold beer and, from the Gringo Academy Test Kitchen, Gringo Gourmet Prickly Pear Cactus Enchiladas with Chipotle Cream. The enchilada stuffing took a little prep, but with a small electric food chopper, it went pretty quickly. The stuffing and sauce came together while the cactus cooked. 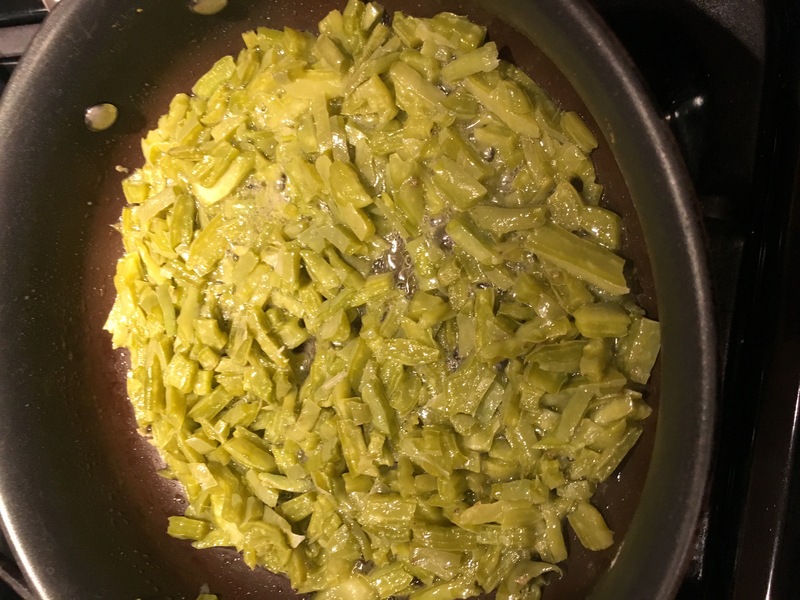 If you have ever cooked cactus (nopales in Spanish or nopalitos when diced) you know that it yeals a sticky liquid similar to okra’s liquid. Traditionally, it is boiled and rinsed three times to remove the sticky. I sauté it in a couple of tablespoons of olive or canola oil. The hot oil causes the liquid to be released and it evaporates. I speed the process up by adding a tablespoon of water to the pan. The water makes steam which hastens the evaporation process. The cactus flesh darkens as it cooks and soon you have a pan of dark green cooked cactus with virtually 99% of the sticky gone. Enchilada filling is chopped while the cactus cooks. You want some texture in the vegetables, so don’t over chop it. Diced cactus begins to darken and lose its sticky texture. 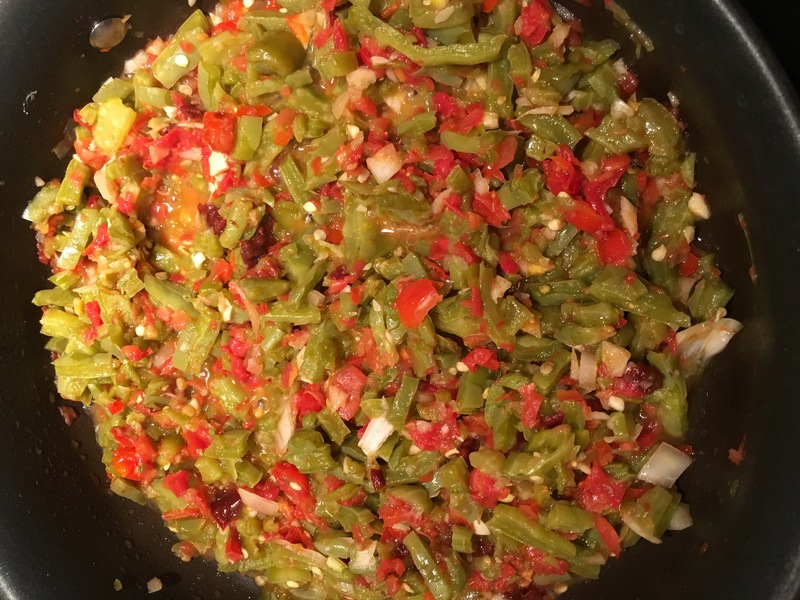 Vegetable filling is added to the pan of cactus, stirred in and cooked until softened. Cactus Enchiladas ready for the oven. I was very happy with how the enchilada experiment turned out. I’ll make them for company soon. The recipe below is for four servings of three rolled enchilada each. You could stack the tortillas with filling in layers, but rolled seemed the thing to do for his meal. The original inspiration recipe called for pickled onion garnish. I decided to use Fresno pepper slices as a garnish instead because I forgot to pick up a red onion. Pickle white or yellow onion would have been too pale for the dish, and I happened too have a few Fresnos on hand. Fresno are a mild pepper and their bright red color perks up a plate. I hope you try this recipe and enjoy it as much as we did. 1 canned chipotle chile and two or three tsp of adobo sauce from the can. Combine vinegar, sugar, and 4 Tbsp. lime juice in a small bowl. Stir in the onion, microwave 30 sec. You want the onion to absorb the flavor, not get too soft. In a large pan, sauté diced cactus in oil until the sticky secretion is evaporated and cactus is a dark olive color. The process can be hastened by adding one Tbsp water at a time to help steam off the sticky secretion. 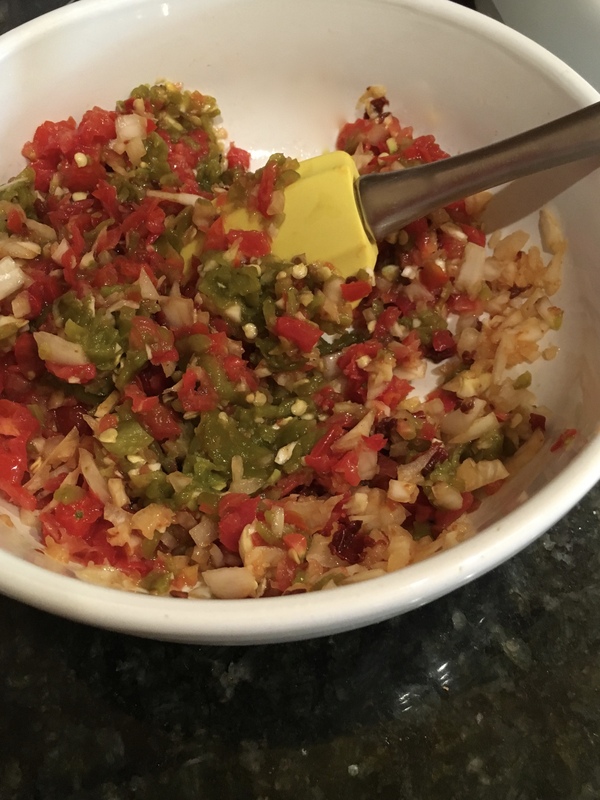 While cactus cooks, chop tomato, chiles, onion and garlic in a food chopper or food processor and mix together in a bowl. When cactus is cooked, stir in vegetable mixture and cook until vegetables are softened. Season lightly with kosher salt. Set aside. Purée chipotle chile and 1/2 cup half and half in a blender until smooth. Stir into remaining half and half and add lime juice. Heat in a wide pot, but do not boil. Season lightly with Kosher salt if desired. Wrap tortillas in a clean dish cloth. Microwave for 45 seconds. Keep stack wrapped. 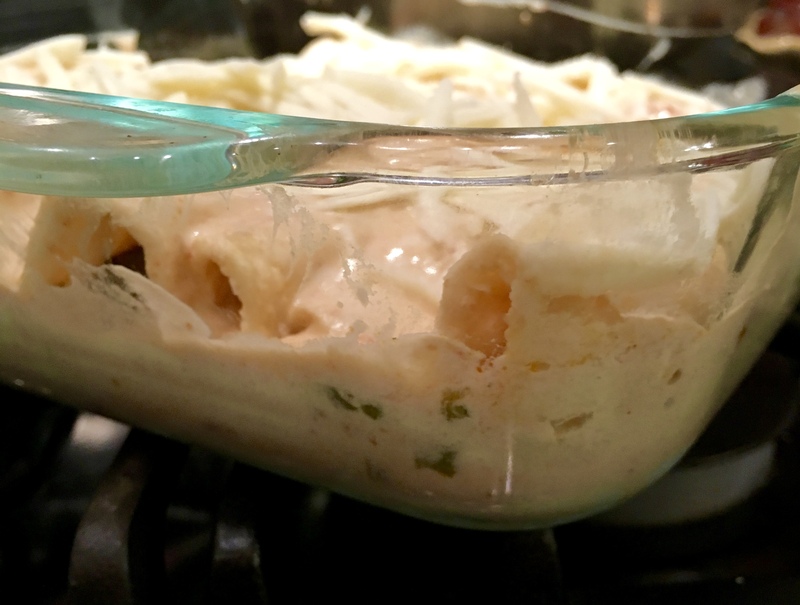 Cover the bottom of a casserole with a few spoonsful of chipotle and half and half sauce. Dip tortillas in sauce, one at a time. Lay dipped tortilla in the casserole and fill with a generous tablespoon of cactus filling and a sprinkle of grated cheese. Roll tortilla and place seam down in casserole. Repeat until tortillas are all filled or casserole is full. Top with a little extra sauce and generous sprinkle of cheese. Bake enchiladas until cheese is melted and edges of tortillas are toasted, 25–30 minutes. Top with reserved pickled onion and sprinkle of chopped cilantro. Add a few pickled onion for a bright contrast of color and flavor. I wouldn’t use the Fresno chile slices and the onion together. 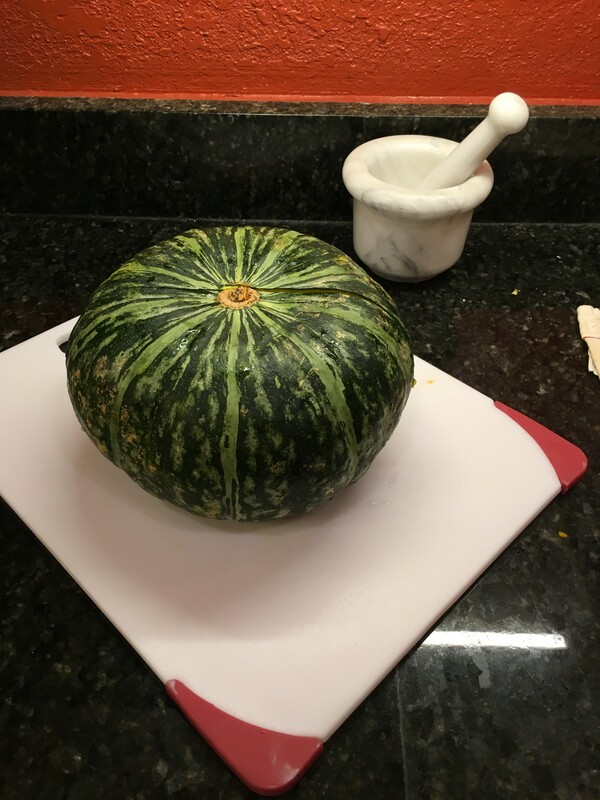 Kabota Squash is My New Very Favorite Thing – This Week! Not a flying saucer. The kabota squash is tender-skinned, golden fleshed and delicious roasted. I’ve read about kabota squash for years and finally a few appeared in town! After bringing home my first one, I had to search for instructions on how to prepare it. I had learned the hard way that all squash are not prepared the same way and I didn’t want to go wrong with this beauty. I found the recipe I’m sharing below. Prepping the squash is easier than I had imagined: halve it, remove the seed, slice into wedges, toss with a little olive oil and roast it at 425° for 35 – 40 minutes until golden and tender. Squash, halved, seeded and cut into wedges. I only need half the squash in wedges, so I roasted the other half at the same time and saved it for another meal. Kabota wedges oiled and ready for the oven. 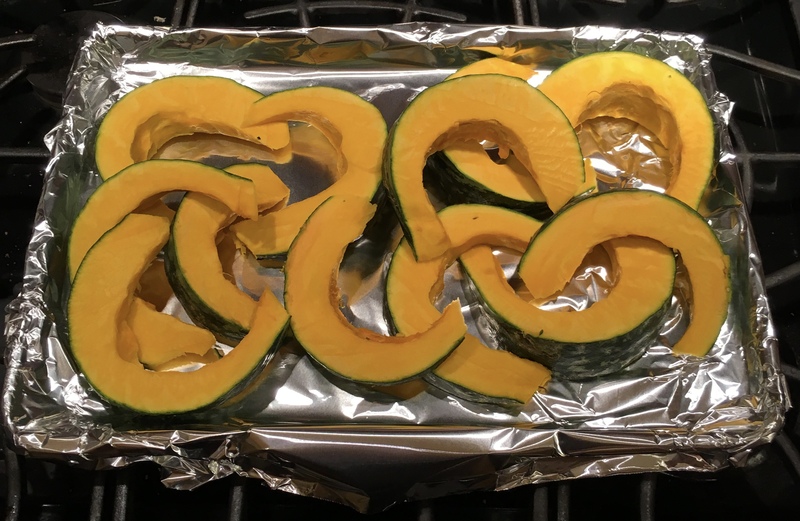 After the squash wedges were done, I removed them to a warming oven and upped the temp of the cooking oven to 475°. I put two inch-thick brined pork chops on a rack over a foil-lined sheet pan and placed them in the oven. I roasted the chops flipping them every 12 minutes to get some color until they reached an internal temperature of 165°. I let them rest tented for about five minutes while I plated the squash. 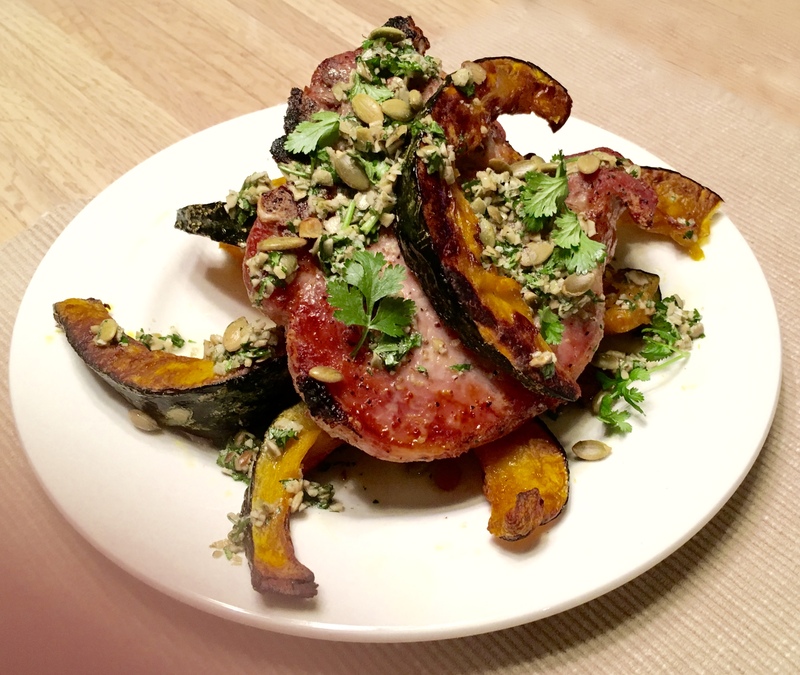 The pork chops were placed on top of the roasted squash and crowned with one wedge. The pumpkin seed vinaigrette was drizzled over the squash and chop and the result was dramatic and delicious. This dish is soooooooo goooooood that I made it twice in one week. You’ll want to do it too. There’s no need to peel kabocha squash; their skins are tender, edible, and add extra color and texture, especially when you let the green skin caramelize and darken. salt and pepper. Roast squash, turning occasionally, until golden brown and tender, 35-40 minutes. Whisk garlic, 3 tablespoons chopped cilantro, 2 tablespoons lime juice, reserved toasted pumpkin seeds, and remaining 3 tablespoons oil in a small bowl to combine. Season vinaigrette with salt, pepper, and more lime juice, if desired. When squash and pork chops are done, divide squash among plates, top with pork chop and drizzle vinaigrette over all. Top with cilantro leaves. I really like this vinegarless vinaigrette on pork and will try in on grilled chicken, too. Nights are getting cooler now. Not really cold, but cool enough to send me looking for soup and stew recipes to ward off the chill. I found one that would be perfect for a Meatless Monday supper, but it worked on a Sunday night when I couldn’t wait until Monday. The recipe called for soaking dry beans overnight and cooking them for a long time. That wouldn’t work with my 4:30 p.m. starting time that included a trip to the store. I did some shortcutting on the beans I’ve shared below and was able to pull off dinner at a reasonable time. The clinchers for me in the recipe were two favorites – fennel and chard. Recipes with either are probably going to be tried and experimented with in the Gringo Gourmet Academy Test Kitchen. Short cuts on the bean prep qualifies as a test kitchen experiment. I’ve labeled some of the ingredients “PDP” which is what took the recipe over the top. PDP = Pretty Darned Pricey. Tomato and Cannellini Bean Soup with Parmesan Garlic Bread – a great vegetarian supper on a cool fall evening. 1 fennel bulb “PDP” my fennel got the PDP mark only because on a Sunday evening, there were only a few very small organic fennel bulbs on the shelf when I went shopping. I had to buy two. 1 Tbsp sherry vinegar“PDP” I keep sherry vinegar in my pantry. It is pricey, but worth it, when you do buy it. Most recipes call for only a tablespoon or two, so it really isn’t that big of an investment over time. 1 bunch Swiss chard, stems removed, leaves torn into pieces “PDP” if you choose organic chard over non-organic. Guess which was the only choice on the shelf last night! Rinse cannellini beans and place in pot with onion, garlic and bay leaves. Add vegetable broth and bring to a simmer. Let the mixture simmer while you prep and start the other vegetables. Simmering the savories in the broth imparts their flavor to the soup and the beans pick up some of it, too. How simple and fast is this? Heat 2 Tbsp olive oil in a large heavy pot over medium heat. Add drained tomatoes and crushed red pepper and cook tomatoes undisturbed until caramelized and borderline blackened on one side – 5 to 7 minutes. Any residual juice from the tomatoes will reduce. Break up the tomatoes and continue to cook, scraping and stirring occasionally until tomatoes are caramelized all over. Scrape the bottom and sides of the pot while the tomatoes finish caramelizing. Transfer the tomatoes to a plate. Heat another two Tbsp oil in the same pot over medium. Add onion, fennel, garlic and another pinch or so of crushed red peppers, if desired. Cook, stirring often, until vegetables are soft and beginning to brown around the edges. Stir in vinegar and tomatoes, scraping browned bits from the bottom and sides of the pot. Drain beans and add to pot with the broth (If using short cut method, add the bean broth and the broth from the box.) Cook until flavors meld – about 30 minutes. Season with salt to taste and add another pinch of crushed red peppers if you like. Just before serving, stir in chard and cook until wilted. Ladle soup into bowls, top with almonds, if using and, if you like, drizzle with a little very good olive oil. I served my version of garlic bread with the soup so I’d be able to sop up all the broth. I don’t use a whole loaf of French bread because I’d eat the whole loaf at one sitting. I get whole wheat bollios at the market and serve one of these wonderful Mexican-style rolls per person instead. Split the rolls, spread them lightly with butter (or olive oil), then sprinkle them with garlic powder and Italian seasoning. Wrap them in foil and health them through in a 375° oven for 10-15 minutes. When I’m feeling decadent, I take the rolls from the oven, up the temp to broil, open the foil and sprinkle the roll halves with a little finely grated parmesan cheese (never the green cheese-flavored sawdust in the green can). I pop them under the broiler for a minute or two until the cheese melts and the bread gets a bit of color and then serve them in the opened foil wrap. It just takes the dinner a little bit more over the top! My favorite chicken is the dark meat. I love it bone in and skin on most of all, either grilled or roasted. Sometimes a leg quarter makes the perfect meal. 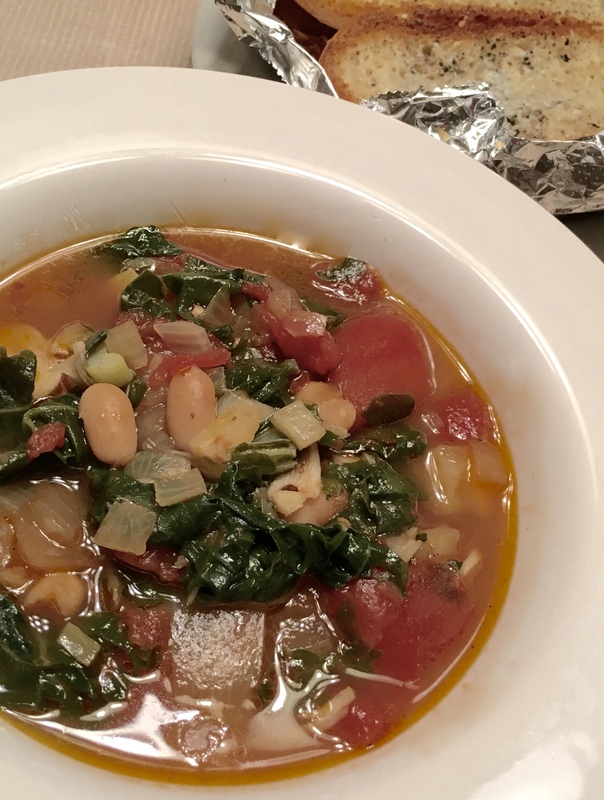 Especially when you add some comfort sides such as sweet potato and turnip greens. I’ve discovered Tajin, a Mexican powdered chili and lime seasoning. It can be used on fruits, vegetables or meats. I like it on chicken, pork and shrimp. It has a nice flavor and is not too hot to manage. I’ve been picking out smallish sweet potatoes, scrubbing them and slicing them in half. I brush the cut side lightly with canola oil because of its neutral flavor and then sprinkle the Tajin powder liberally over it. Then, it goes face down on a foil lined sheet pan and into a 375° oven for about 45 minutes until the potato is fork tender. While the potato is roasting, I cut as much fat off the leg quarter as I can without removing too much skin. The, I brush it lightly with canola oil and put it on a rack on another lined sheet pan and pop it in the oven beside the potation and let it roast and brown while the potato finishes. It is usually done in 20 – 25 minutes. While they roast, I wash my greens. You can use you favorite slightly bitter green. I like either turnip or collard. I bring water to a simmer in a pot that will hold the raw greens. I make thin slices of two cloves of garlic and toss them with the greens and put it all in a colander and into the pot to simmer and cook down. I check the chicken with a meat thermometer as it begins to get brown and when it is about 165° and the juices run clear where I poked the thermometer, I take it out of the oven, tent it with foil to rest while I plate the potatoes and greens. I like a splash of red wine vinegar and salt on my greens or, sometimes, a couple of hits of hot sauce. That hint of acid makes the greens flavor extra good. Remember to season with salt and pepper at the end of cooking. This meal is so simple you don’t need a precise recipe. Just do it and dig in! 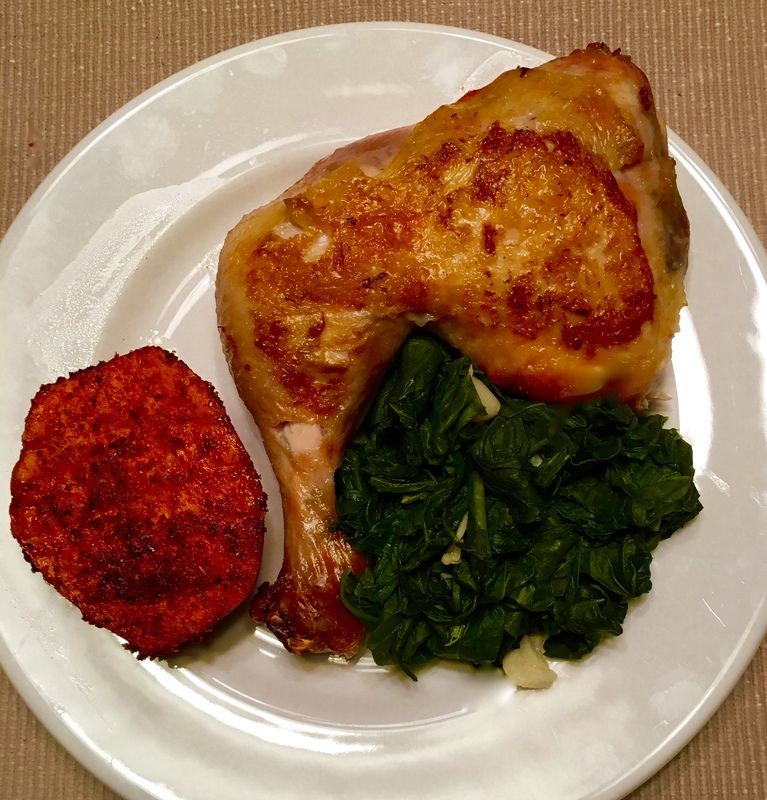 Roasted chicken leg quarter with greens and garlic chips and chile-lime seasoned sweet potato – comfort food with a little kick and a lot of flavor. Long, long ago, my children began to learn to cook using a protein and mixes including tuna helper and hamburger helper. After a short period of this, we began to try combinations of ingredients instead of dumping them out of a box. Most of these experiments were successful. On memorable one was not when a spice that was the same color was substituted for another. This, too, was a valuable lesson. I had a flashback not too long ago when I needed to come up with a way to use some boneless, skinless chicken thighs that were in the refrigerator. I routed through the fridge and through the pantry and gathered a group of items that were basically what I needed for Glop. Since one of the ingredients was green chile sauce, it needed a Spanish sounding name. It became Pollo al Glopo (chicken with glop). It was cooked in an 8-inch pan. Half the pan made a tasty dinner. The other half was reheated the next morning and topped with eggs over-easy to become Huevos Con Pollo al Glopo (eggs with chicken in glop). Pollo al Glopo with red and green jalapeños makes a tasty supper. 8 inch square baking pan, lightly oiled. Boil and chop thighs in chicken broth to cover. Remove thighs when finished, let cook and then chop into a half-inch dice. Add onions and garlic to broth, reduce heat and simmer until savories are tender and broth is reduced, but not totally simmered away. You might need to add another tablespoon or two to prevent scorching the onions. Add cream of chicken soup and stir. Do not add a whole can of water or milk to the can. You may add a little liquid to help stir it, but you want it thick. When soup is smoothed add chicken, beans, corn and chile sauce. Heat through. While the Glop0 is heating, stir the cornbread mix, required liquid and chopped green chile. Add heated Glopo to the oiled pan, smooth it and pour cornbread over the Glopo, smooth it out. Put the pan into the oven and bake until Glopo is bubbling and cornbread is done. Huevos con Glopo al Pollo are eggs over easy on top of warmed over Pollo al Glopo for breakfast. Enchiladas montadas are stacked, not topped so this treat of leftovers should not be called Glopo Montada. This recipe will probably never be exactly the same each time you make it because you can’t always duplicate the ingredients of a good pot or pan of glop. It doesn’t count if you shop for glop. It is a found dish. No children’s cooking skills were harmed by this flashback. *When I was in Vietnam, we’d use cream of chicken soup, canned tuna, canned green peas and curry powder and call it War Zone Chicken Curry. My room mate was Japanese American and taught me to make rice that wasn’t gummy to serve with the curry. Even with another name it was still a glop.